We were on a camp site in Beddgelert Forest in North Wales. On one of my trips to the toilet block, I thought how often it happens that someone goes into the cubicle next to yours – even when the others are empty. Then I began thinking, supposing that there was a purpose to it, and that the person doing it was stalking you for something bad you’d done. Over the next day I had almost the entire plot of a story in my head, including the title. I began writing it in the caravan, and finished it while we were on a cruise to the Arctic Circle a week or so later. 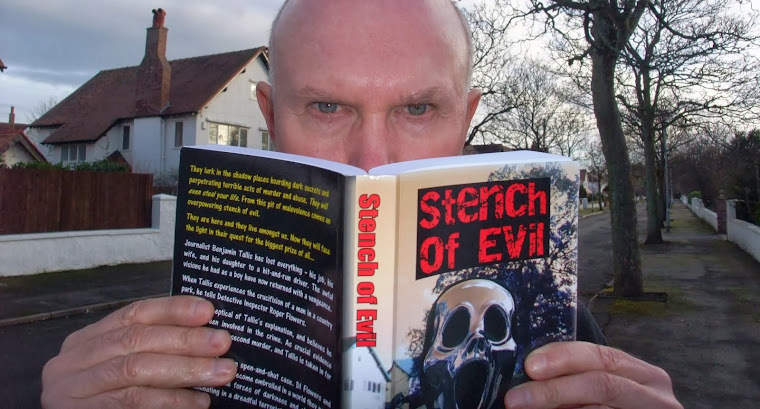 The urge to write it down was so strong, that it interrupted work on The Devil Inside, the sequel to my novel, Stench of Evil. This photograph almost got us arrested! For the eBook publication, I also had to create a cover illustration. I knew what I wanted – a cubicle door ajar, with a hand gripping it. While we were still in North Wales, and I was halfway through the story, we visited a town (which shall remain nameless) and parked near to a public toilet. It was a quiet day. 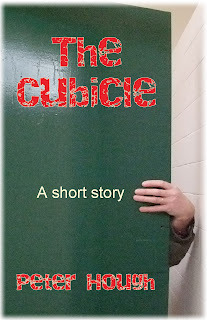 We had the camera, so we could get some photographs of me gripping a cubicle door. There was a possibility of us being caught of course. Imagine someone walking in and my wife’s taking flash photographs of me! Who would believe the explanation? If that did happen, I decided it would be a lesser crime if Linda was caught in the men’s loos, rather than me in the lady’s.